Reading Christine Blasey Ford's testimony was already convincing, but I don't think anyone who watched her deliver it believed one second that she was lying, including many Republican senators who will anyway vote to elevate Brett Kavanaugh to the Supreme Court. 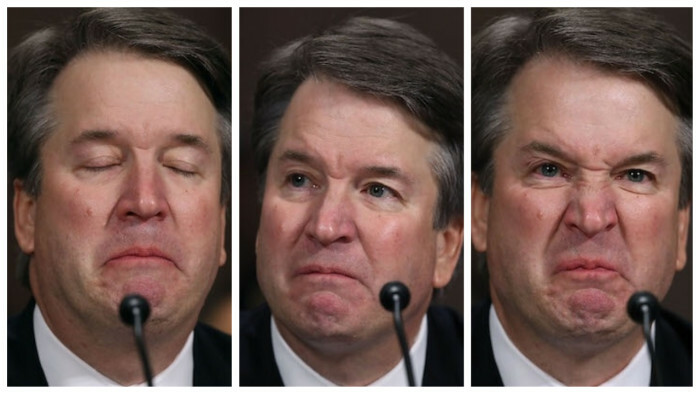 In contrast, Kavanaugh exposed himself (!) as a shamelessly partisan judge with major anger management and alcohol issues, not to mention a total disrespect of fairness in justice. This man should be not only totally disqualified for the SCOTUS, but challenged for his status as a judge altogether. Since he chose indecency, and refused to withdraw his candidacy, he deserves the fair and thourough investigation Ford was deprived by GOP Senators in the most outrageous process ever. Even before Donald Trump officially ordered Senators to vote and confirm him, Republican members of the Committee went full throttle behind this disgraced judge, even dumping their 'female assistant' smokescreen to scream in unison with Kavanaugh the 'victim'. Because the only thing that matters for them seems to be making sure the Supreme Court will tilt to the wrong side of History, whatever the cost. No one objects. Susan Collins just had to say it would be fair to investigate further, and to postpone the vote, but so far nothing. It seems that Collins doesn't mind ruining her legacy, and remaining forever the betrayer who failed to stand for womens rights in America when they most needed it. Unless Susan Collins rises to the challenge, and choses decency, the Supreme Court will be tainted even more than when Clarence Thomas joined it, decades before the words 'hashtag' and 'metoo' even existed. Susan Collins met with Jeff Flake, Lisa Murkowski to decide how (whether) to vote. They brought on board Joe Manchin, one of the few Democrats able to confirm Kavanaugh to secure his reelection. History is watching them mercilessly.